Plex is adding web shows to its lineup of content. This means that anyone with a Plex account can watch web shows on the Plex app. All for free, and all on demand. Plex Web Shows is currently in beta, but already has a good selection to choose from. While Plex may be best known as a media player for people’s personal collections, it’s slowly but surely pivoting to become a means of streaming content from the web too. In May 2018, Plex added support for podcasts Plex Adds Podcasts and Customization Options Plex Adds Podcasts and Customization Options Plex has redesigned the way its mobile apps are structured, but the two most noticeable changes are new ways to personalize Plex, and support for podcasts. Read More , and now it’s adding web shows too. On the Plex Blog, Plex states it has “partnered with a number of media producers to bring you high-quality episodic video content inside Plex!” While most of these shows can already be found elsewhere, Plex hopes you’ll choose to watch them on Plex. These Web Shows are available for free to anyone with a Plex account. You don’t need either a Plex Media Server or a paid Plex Pass subscription. Instead, you can just log in to your account, open your Plex app, and watch these shows to your heart’s content. At launch Web Shows offers thousands of episodes across dozens of shows. Publishers include Condé Nast, Bonnier Corp., Fandor, Future, TWiT, Jukin, and Studio 71. Shows include Epic Meal Time, ASAPscience, People are Awesome, and The Pet Collective. 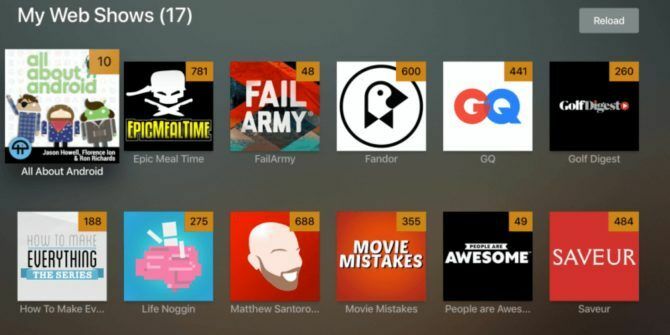 While Web Shows is still a work in progress, when combined with Plex News and Plex Podcasts it suggests Plex has big plans for the future. Plex is moving beyond its humble beginnings, and blossoming into a massive media ecosystem. We have written extensively about Plex. So why not read our guide to Plex Your Guide To Plex - The Awesome Media Center Your Guide To Plex - The Awesome Media Center If you have a lot of locally-saved movies and TV shows, you need to install Plex. And this is the only guide to getting started with Plex you'll ever need to read. Read More , or discover everything you need to know about Plex Live TV Plex Live TV: Everything You Need to Know Plex Live TV: Everything You Need to Know Plex has added live TV channels to its service, but what exactly is Plex Live TV? We have everything you need to know about this exciting new option for cord-cutters. Read More . Alternatively, you can see what you get with a Plex Pass subscription Plex Pass: What Do You Get for Your Money? Plex Pass: What Do You Get for Your Money? In order to know whether or not you need a Plex Pass, you first need to know exactly what you get for your money. Read More , or find out what Plex settings you need to change 5 Settings All Plex Users Need to Know About 5 Settings All Plex Users Need to Know About Plex works straight out of the box, but that doesn't mean there aren't some options you should tweak. Here are five of the most important settings all Plex users need to know about. Read More . Explore more about: Media Streaming, Online Video, Plex. adding all of these things that the majority of PAYING Plex pass users either don't want or would rather they fix bugs etc.. that have sat in the forums for the longest time. I doubt I will be renewing my Plex pass after this year and will be trying something else. It is becoming to cluttered.